2 bedroom apartment with full furniture for rent in the building no. 713, Lac Long Quan street, Tay Ho, district, Hanoi. Total living area is 86 sqm, composed of 2 bedrooms, 2 bathrooms (1 shower cabinet and 1 tub), a nice living room and kitchen. Located on middle floor, full of natural light and fresh air. . 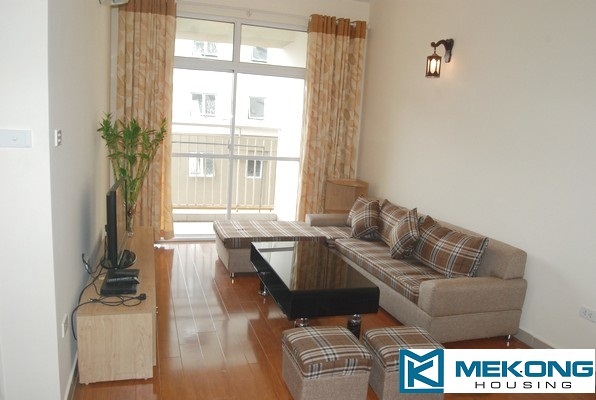 Fully furnished apartment with 3 bedrooms for rent in CT2B Tay Ho Residence, Tay Ho, Hanoi. Total living area is 107 sqm, composed of 3 bedrooms, 2 bathrooms, a living room and a kitchen. The apartment is equipped full furniture and high quality equipment. It is corner apartment, has wide window, balcony so the room is full natural light, fresh air and looking toward the Westlake. Price: 800 usd/month Please contact me at 0936 670 899 or huong@bdsmekong.vn for more information. The apartment is located in convenient location, nearby Ciputra and Westlake area. The building is closed to Nhat Tan bridge, easy access to Noi Bai International Airport and other districts in Hanoi. One bedroom apartment for rent in Dang Thai Mai street, Tay Ho district, Hanoi. Total living area is 70 sqm, composed of a nice bedroom, a bathroom, a living room and open kitchen. The living room is combined with dinning table on 1 surface. The apartment is full furniture: air conditioner, tv, sofa, washing machine, wardrobes, cooking stuffs,..